Take pleasure in wearing these beautifully designed monogram earrings, as they look simply gorgeous on the ear and next to your skin. The Classic Monogram Earrings in Sterling Silver are shaped into a lovely round pattern that transforms three simple letters into a work of art. These round monogram earrings each measure 15mm by 15mm and attach to a silver ball with a push-back post where the earrings sit in the ear. These stunning earrings feature an open design that allows light to pass through, letting the silver earrings shimmer and shine as they dangle comfortably from the ear. The pattern is based on an artistic representation of up to three letters of your choosing. The letters are meticulously cut and positioned next to one another in such a way as to form a complete circle. This is your chance to own a truly original piece of silver jewelry. Take pride in wearing these monogram earrings as they create the perfect way for you to play with your style in a very meaningful way. Plus, these silver earrings are incredibly easy to match with other silver pieces, including the monogram pendant in the same series. Monograms measure 15mm (9/16") x 15mm (9/16") not including posts. Including posts earrings measure 23mm (7/8") in length. 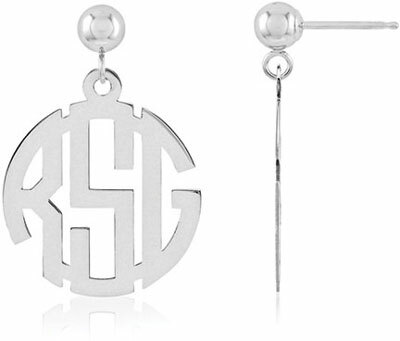 We guarantee our Classic Monogram Earrings, Sterling Silver to be high quality, authentic jewelry, as described above.